Preheat the oven to 325 degrees F. Line two baking sheets with parchment paper and set aside. In a small bowl add the flour, baking powder, baking soda and salt, mix well. In the bowl of a kitchen mixer such as a Cusinart, fitted with a paddle attachment, add the butter, coconut oil and sugar. Mix on low until well incorporated. With the mixer on low, add the egg, vanilla and almond extract. Slowly add the flour mixture and mix until the dough starts to come together. Remove the dough from the mixer and using your hands, roll into small balls, about one inch in diameter. Place the white and black sesame seeds in two small shallow bowls. Divide the balls in half. 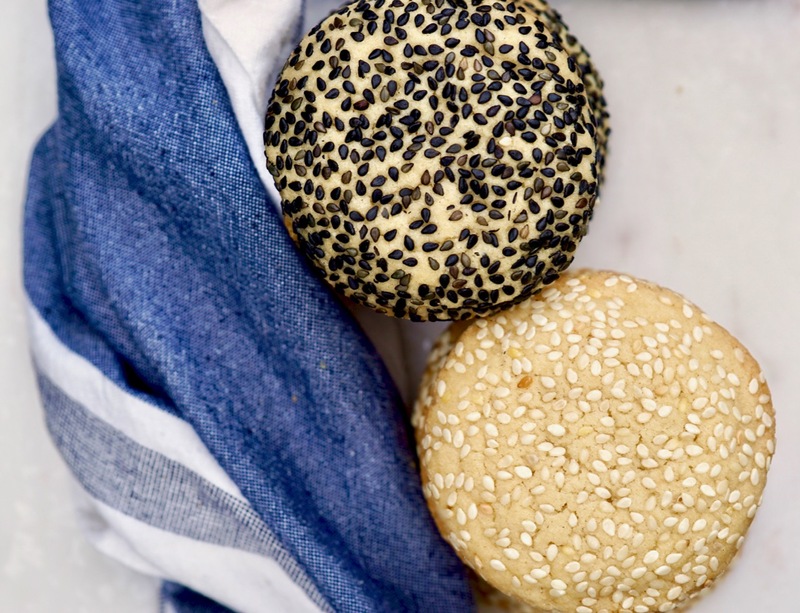 Working in batches, roll half the dough balls in the white sesame seeds to coat and the other half in the black sesame seeds. Place the coated dough balls on the prepared baking sheets about two inches apart. Place the cookies in the oven and bake until set, about 12-15 minutes. Allow to cool before removing them from the baking sheet.